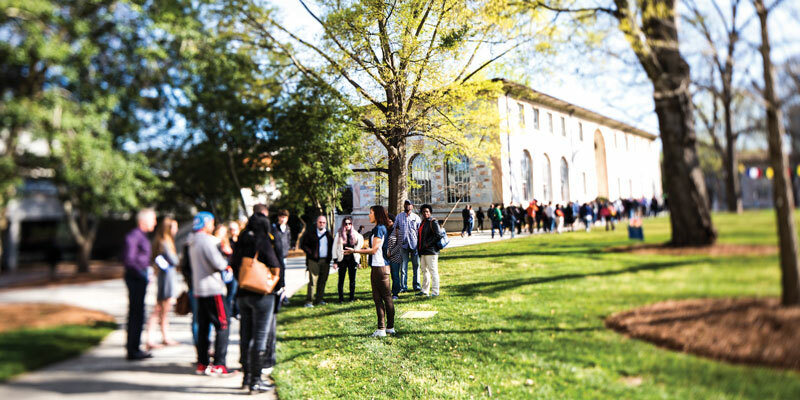 In the hustle and bustle of choosing where to apply to college (check out that series here), students, parents, and guidance counselors often wonder how Emory University views “demonstrated interest” when we read applications. Wait, what is demonstrated interest? Demonstrated interest can be a hazy, all-encompassing term that means something different at different institutions. Generally it means that a student has clearly expressed their enthusiasm and interest in a school by visiting campus, attending an off-campus event, or sending a certain number of emails, letters, or phone calls to the admission office. Some schools factor a student’s demonstrated interest into whether they want to admit that student (or not). Does demonstrated interest matter at Emory University? Why doesn’t Emory University consider demonstrated interest? There are many reasons we do not factor demonstrated interest into an applicant’s decision. One of the most important is that we truly want to admit students based on who they are. From our perspective, filling out an entire application, finding teachers to write letters of recommendation, and submitting your short answer responses is not a flippant decision. If you’ve taken the time and energy to do that, then that’s all the interest we need to see! Obviously you are interested in attending Emory University. Additionally, and perhaps just as important, is that we understand that there are many reasons why a student would not be able to visit campus or attend an off-campus event with us. Perhaps we aren’t visiting the student’s city. (Or state. Or country.) Or the days we are going to be in the student’s area, she has a basketball game, or he has a debate competition, or needs to work, or doesn’t have a ride to the venue. Maybe getting to campus for a tour and information session is just not feasible for many of those same reasons. We simply don’t want to penalize students for normal life circumstances. So why should I visit campus? We would love to have you visit Emory University! Visiting campus is about seeing if you like it here and can envision calling this place home for the next four years. We want you and your family to come, walk around campus, talk with our admission staff, interact with current students, and explore the surrounding areas. Learn more about scheduling a visit. Both Emory College and Oxford College offer information sessions with admission staff as well as campus tours led by current students. Sessions are held Monday through Friday, all year long. Select Saturday sessions are also available at Emory College. Want the best of both worlds? Emory and Oxford visit sessions are scheduled in such a way that you can visit both in one day, with your evening free to explore Atlanta. Shuttles run between the two campuses regularly, or you can also drive yourself. At Emory University, learning is clearly what we are all about. We are a selective university with stellar faculty and high-achieving students. But more than that, we are a community of vibrant thinkers, engaged participants, and courageous learners. We are looking to challenge one another to be the best that we can be, and we are looking for students who will make a positive contribution to this academic community. We believe that by applying, you are clearly interested in us, and we will do our due diligence to read your application (read more about our selection philosophy here).